I, the Soshihan of Aikido Kobayashi Dojo, began my Aikido career at Hombu Dojo in April of 1955. Just three months or so after I started practice, a demonstration for the public was held on the roof of the Takashimaya Department store in Nihonbashi, Tokyo. This was a great opportunity to make known Aikido to a wider audience, and featured the founder, Morihei Ueshiba. Soon after this demonstration, people began to flock to the dojo. It was only ten years after the war, and the economy hadn't recovered yet; people didn't have much money. In that era, we thought 15 people at any practice was a lot. O Sensei would give a seminar every spring, and on the last day, he would give a demonstration. The number of days the seminar was held gradually got fewer and fewer as the years passed. 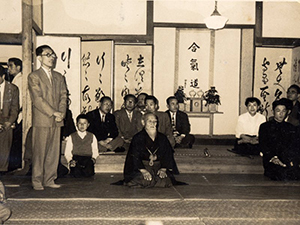 In 1960, on May 14th, the first Aikido Demonstration outside Hombu Dojo was held in the Shinjuku Yamano hall. 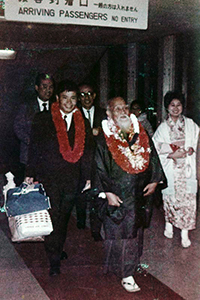 The next year, in 1961, O Sensei went to Hawaii to attend the founding ceremony of the Hawaii Aikido Conference, so no demonstration occurred that year. That the All-Japan Aikido Demonstration (Zen Nihon Aikido Embu Taikai) wasn't held continuously was something I just became aware of as I was checking my notes and records. The 2nd All-Japan was on April 29th, 1962 at the Asahi Newspaper Hall in Yurakucho. Because of that newspaper's vigorous ad campaign for the event, so many people showed up that they couldn't all get in. In order for ordinary citizens to get a seat, the university clubs gave up their places, as I recall. After that, the event moved to Hibiya Town Hall until 1963. The year construction of the new Hombu Dojo was completed. On the 6th anniversary of the new Hombu, O Sensei gave his final demonstration on October 5th, 1968, opening the mysteries of Aikido to all. He passed away April 26th, 1969. 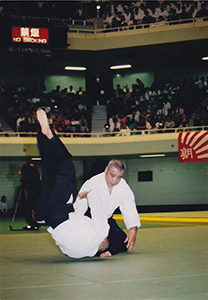 The 7th All-Japan was held that year for the first time in the Japan Budokan (and just 20 days before Aikido Kobayashi Dojo Kodaira Dojo opened). From 1970~1976, the 8th~14th All-Japan Aikido Demonstration returned to Hibiya Town Hall, then moved back to the Budokan the year after and then every year thereafter. The May 21st, 1977 event saw over 1000 participants for the first time as well, as I recall Kisshomaru Doshu saying. From then on, the event was always held in May, and two years ago was the 50th. The peerless Kisshomaru Doshu, many of my seniors, Shihan colleagues and juniors would gather every year for the event. Tada Shihan, who started the teaching of Aikido in Italy, preceded Kisshomaru Doshu in the program, but because of his commitments in Italy, he wasn't always able to attend the festivities. 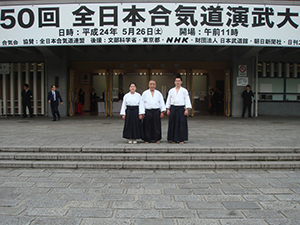 So I am the only one who has attended every All-Japan Aikido Demonstration! Two years ago, at 75, I turned over the responsibilities of Aikido Kobayashi Dojo to my son Hiroaki, now head of the Dojo (Dojocho). While I enjoy making the rounds of Dojos affiliated with us both here and abroad, I requested that the 50th be my last All-Japan and received permission from the 3rd Doshu to give a 3-generation demonstration with myself, Hiroaki, and my granddaughter, Kaho, and we carried it off. So many people have said that it was too bad that I won't be appearing in the All-Japan. It has been my honor and privilege to do so for 50 years. Last year in April, I received an invitation to appear, but I asked that Hiroaki replace me and for the first time, he had the privilege of giving a solo embu. From then on, I intended to go to the Budokan every year and enjoy everyone else's demonstration, but then last year, I got a call from Miyamoto sensei on April 13th, requesting my participation in the demonstration. Well, I told him that I had appeared in 50, so I had made the 50th my last, but he explained that the request came directly from Doshu. For a moment I paused in confusion, but I couldn't refuse a request directly from Doshu, so I said "It will be an honor to participate in the 51st All-Japan Aikido Demonstration." The demonstration I gave felt perfectly tuned, and to be able to give such a fine performance in from of everyone remains a grateful, fond memory.